Reykjavik, on the coast of Iceland, is the country’s capital and largest city. It is the centre of culture and life of the Icelandic people as well as being one of the focal points of tourism in Iceland. Tracing Iceland’s Viking history, it’s home to the National and Saga museums. 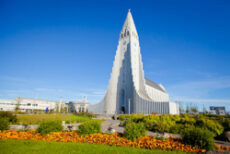 The striking concrete Hallgrimskirkja church and rotating Perlan glass dome offer sweeping views of the sea and nearby hills. Exemplifying the island’s volcanic activity is the geothermal Blue Lagoon spa, near the village of Grindavik. One of the advantages of Reykjavik is being able to see it on foot. For passengers spending time in the city there is a wide choice of museums, galleries, restaurants and cafés. Shooping is a must too and the ultimate relaxation experience is a trip to one of the city’s thermal baths and pools. Tours outside the city give you an idea of the many contrasts of Iceland’s natural beauty from lush valleys to barren higlands, from thunderous waterfalls to silent, mystical glaciers, from lava fields to sandy coastlines, from hotsprings to geothermal spas. Sunny days feel like spontaneous holidays in Reykjavík. Sunbathers and picnickers fill Austurvöllur, the green square in front of Parliament; locals and tourists alike stroll up and down Laugavegur, the main drag, shopping, stopping for coffee, and people watching. The thirsty jockey for sparse outdoor seating at bars as happy hour rolls around. Crooning buskers line the sidewalk; performance artists stage surprise acts; maybe a marching band appears from the ether. Anything can happen.